Featuring Lucho Carrillo on vocals and Lucho Reyes on lead guitar, plus no less than four percussionists, they’re terrific live and can’t be missed playing the Winthrop Barn on Friday, October 9th at 7pm. The Cumbia All Stars unite luminaries drawn from some of the major bands of the golden age of 70’s and 80’s Peruvian cumbia in a stunning and contemporary reprise.Almost like the Buena Vista Social Club of Lima…but with surf rock guitars and a touch of psychedelia! Few musical styles have been so unanimously popular as Cumbia in Peru. Planting its roots at the capital´s suburbs among the children of immigrants and in remote cities of the Amazonian Jungle, its mesmerizing melodies have been in the air for more than forty years. Cumbia All Stars is a tribute to such a phenomenon and at the same time a journey in search of the authentic sounds of Peruvian Cumbia. With its bold guitars and jerky beats, Cumbia All Stars dusts off majestically the best songs of the genre and innovates composing new melodies while remaining loyal to its traditional background. In this project the living legends of Cumbia are present: great musicians who were involved in the creation of this new rhythm back in the 1970’s and who have kept on playing it during more than four decades. The Cumbia All Stars is a stellar ensemble comprised of musicians from the legendary bands of psychedelic Peruvian Cumbia who have united to recreate the sound they helped popularize during the 1970s. 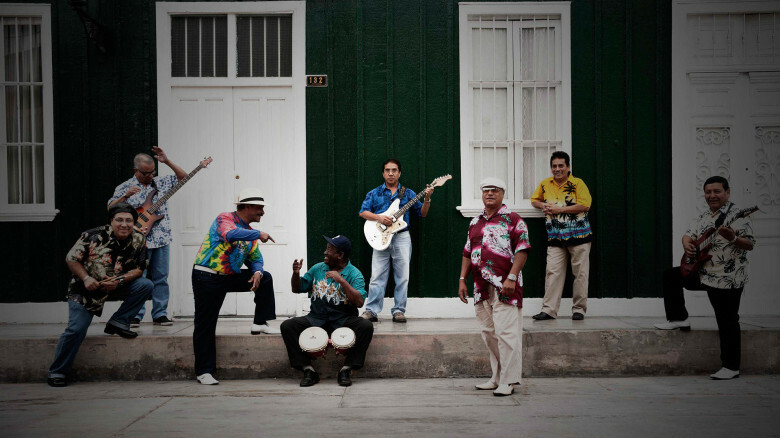 The band members started their careers as pioneers in a Peruvian variant of Cumbia, a music genre popular throughout Latin America that originated along Colombia’s Caribbean coast and Panama with cultural roots in local indigenous populations. Cumbia All Stars presents an original sound of delirious melodies with bold guitar, dissonances and funky beats. The group has completed three world tours and performed at important international festivals including Shambala (United Kingdom), Festival Paleo (Chile), Polé Polé (Belgium) and 2013 WOMEX.